MIURA sees possible expansion of production facilities By obtaining Halal Certification for Miura Boiler Mate. Miura as the owner of the largest small-scale boiler market in Japan, through its subsidiary in Indonesia has been certified halal, to prove that its products in accordance with the teachings of Islam. Need to expand the domestic market of Indonesia and in ASEAN. And with the development of sales volume especially on small type boilers, Miura sees the possibility to expand production facilities in the next few years. 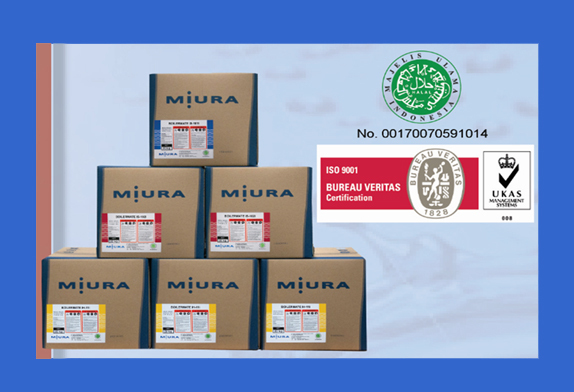 Miura Indonesia has obtained halal certificate from Majelis Ulama Indonesia (MUI) for 5 types of boiler products in production. The first three types of boiler friends are chemical liquids used to prevent corrosion due to insertion of calcium contained by water in the walls in the kettle; The next two types are the chemical liquids used to protect the pipe from corrosion due to the influence of carbonate-oxygen condensate (water drain). Miura Indonesia is located in the industrial area of KIIC in Karawang, West Java. Miura boilers can be used well in the food industry because it has implemented the US Food and Drug Administration (FDA) standard, and the safety level is also guaranteed. Miura's halal products will begin to be distributed in February. From several Miura production centers around the world (China, Korea, Taiwan, America), Indonesia is the first halal certification. With a Muslim population of about 90%, halal certificates are felt necessary to provide a sense of comfort to local staff in the production process. And in Indonesia as well, halal certification for boiler mate for the first time, and this becomes [more value than similar products]. Boiler production capacity is currently around 450 units. And this year's sales are projected about 380 units. Last year only for Indonesia's domestic sales, starting this year will be exported to Thailand, Vietnam, Myanmar and Bangladesh. And to improve its quality, Miura Indonesia will get ISO 9001 (Quality Management System) certificate. And to improve the service to the customer, also done service [online maintenance], that is sending error data / warning from boiler to customer by using online facility. With international standard and service standards such as in Japan, sales are expected to increase. And as a medium-term target, in 2017 will be increased production capacity by 50%, so that in 2018 projected sales reach 500-600 units. And in the same year, need expansion warehouse expansion.